HIJACK is Kristin Van Loon and Arwen Wilder, and Van Loon and Wilder have been HIJACK for nearly 25 years. They have performed all over the place, and I have seen a number of their performances, some small—the two of them, a few minutes, in a room—some large, such as their Walker commission a few years ago on the McGuire stage, an evening-length piece with a cast of about a dozen. But in all these years, I have never, ever seen them perform with a screen. I think they would agree with the statement that they are wary of screens, suspicious of them, or even “anti”—they are serious about the liveness of performance, strict about it—the point of performance is to be there, right then, with people in motion. However, HIJACK does have history with the Mediatheque itself, as a room at the Walker Art Center. Before the Mediatheque was the Mediatheque, prior to the generosity of The Bentson Foundation, it was called the Lecture Room, and it was not unlike it is now—seats, a podium, a screen—but it was relatively underutilized. The space’s recent transformation into the Mediatheque has included the installation of a high-quality digital projection system with a touch-screen interface, so that guests to the museum can pull up any one of hundreds of titles from the Walker’s Ruben/Bentson Moving Image Collection. Films and videos that used to be only accessible by appointment, and would otherwise sit quietly in a vault in the dark basement, are now viewable anytime the Walker is open, to anyone (you actually don’t even need to purchase museum admission; you can walk right in there). For years, HIJACK illicitly used that underutilized space as free rehearsal space. Since any museum patron would assume that they had an official reason to be there, and the museum guards (presumably) assumed that they were normal museum patrons with their memberships, they got away with it with remarkable consistency. Since HIJACK has been so clear about their avoidance of video in the past, this commission by the Walker’s Moving Image department, to specifically make something in the Mediatheque and with the Ruben/Bentson Moving Image Collection, is probably the best possible scenario for getting HIJACK in a room with video, in an interesting way. The collaboration, begun in January of 2017, will consist of three different performances with different works from the collection—the first was in March 2017, the second in July, and the upcoming third on September 28. 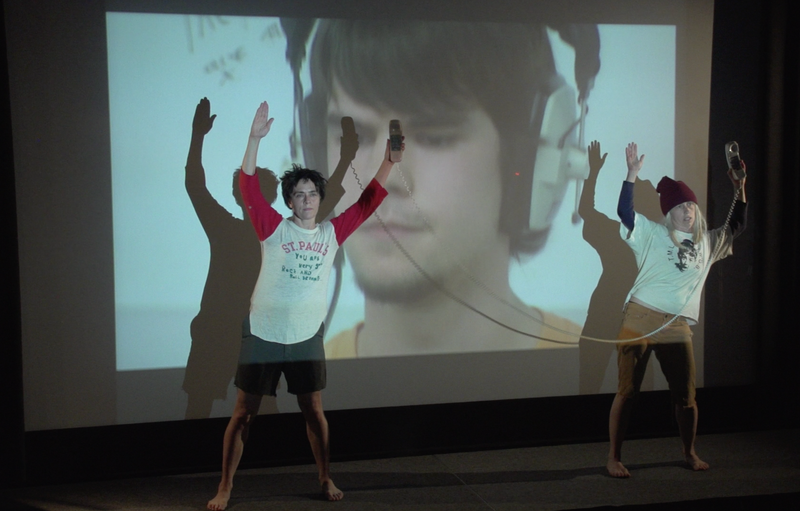 Drum Room by Miranda Pennell (2007) was an amazing and sublime choice of a moving image work for HIJACK to use. It takes place in a sparsely furnished, clinical-looking practice space for musicians, with white-painted cinderblock walls and cheap corporate gray carpet. Though I am not a musician, it immediately registered as a practice space for me from merely passing through the music buildings at the University of Minnesota, and from faint memories of participating in jazz band and pit orchestra in high school. At first the camera doesn’t move—we see architectural, geometric shots of these spaces. And then, when it does move, it moves smoothly and slowly, disembodied, drifting steadily through doorways and around corners, revealing… drummers. All the drummers are young and white, most are male, and all are immensely serious, focused, staring straight ahead into the distance. All wear ’70s-era headphones, the uncomfortable vinyl kind with a metal wire connecting the ear-cups, that I remember as inevitably too tight, uncomfortable and sweaty. We realize, though, that we can’t hear it, that they are listening to music tracks with the drums removed, as a learning tool, so they can learn to play along on a drum pad, reproducing the rhythms required for the song without all the volume of real drums. First we see individual drummers and then larger and larger groups, playing along in the same room to the same tracks—what would be an impenetrable thundering if they all had actual drums becomes a strangely rhythmic tapping patter, like a rainstorm with a metronome. At some point guitars are introduced, along with serious teenage white male guitarists—but the same system is in use, so their strumming on their unplugged electric guitars is faint and distant. 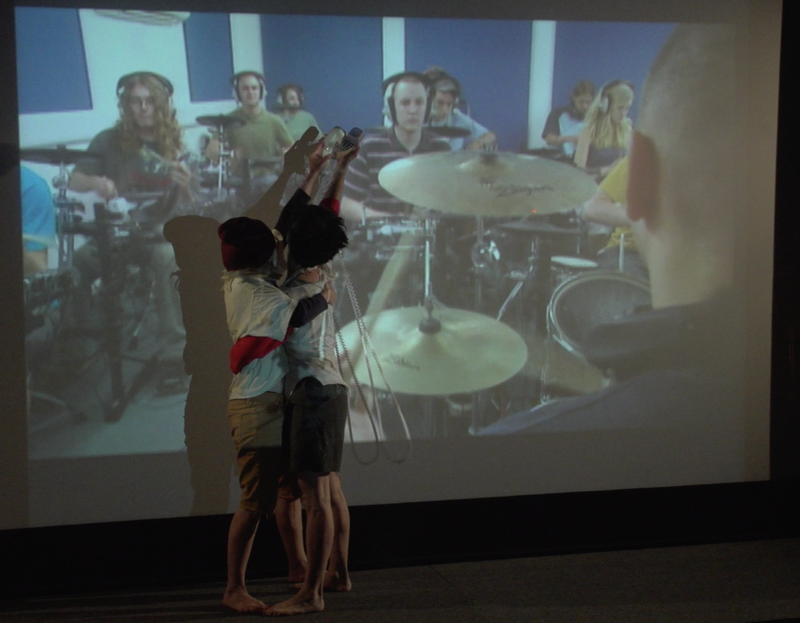 At the climax of the film, for only a few seconds, we’re finally let into the sound coming through the headphones—an up-tempo rock song fills out the soundtrack, while we watch a serious young drummer unleash a storm of taps on his vinyl drum pad. And then the music is gone again, and we’re back in the monastic near silence of the practice rooms. That one subjective moment unfolds the whole inner world of these aspirants, their dreams of rock stardom on a vast scale, their intense love of music and their desire to master the form, to fit into the band, to drive these songs forward. I saw the film three out of the four times it was shown along with the performance on the evening of July 13, during the Walker Wide Open Party, with people filing in and out in the few minutes between runs. Each time I marveled anew at the perfect shape of the film, the way it unfolds shot by shot and moment by moment so carefully to build a concise architecture that elegantly suggests the contours of a music world that extends far beyond its white cinderblock walls. As a choreographer, how do you respond to a moving image work as perfectly realized as Drum Room? How do you make something that is not mere embellishment, that could even stand on its own, and yet is intimately entwined with the film? Where do you begin? I don’t know where HIJACK began, but as an audience member, they provided a fantastic entry point in the form of a simple but delicately absurdist prop, which could have been pulled right from a Dadaist painting or a Fluxus performance. At one side of the bare, four-foot-wide stage there was a podium, basically serving as a tilted table or shelf, and on that table were Trimline phones of a very specific vintage: simple, corded, clamshell, pushbutton phones—beige-ish and featureless, utilitarian, of the ’70s and ’80s, before cordlessness was all the rage. Drum Room was made in 2007, but with those phones and their costumes (consisting of shaggy wigs and torn t-shirts), Van Loon and Wilder connect the film viscerally to their own teenagerdom and underline the timelessness of the scene—the teenagers in the drum room, except for their cargo shorts, could be serious teenage musicians of anytime and anywhere. It’s not immediately apparent, but we soon discover that the two phone receivers are connected by a long spiral plastic cord not to their own bases, but to each other: Van Loon holds one and Wilder the other, and they are free to roam across the stage and through the space (even over the heads of the audience at one point), connected by the spiral of the cord. 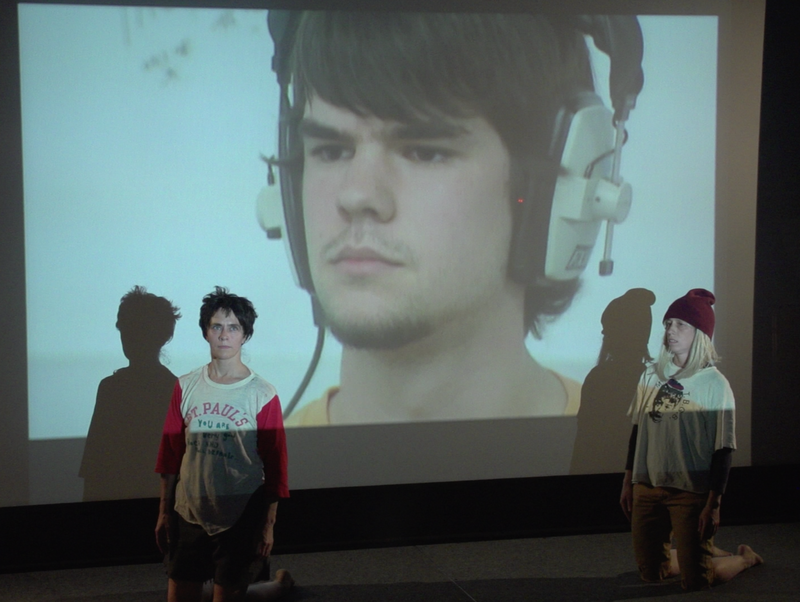 With utmost seriousness in their shaggy wigs, HIJACK moves through the space, connected by the cord, and the audience sees a whole world of spectatorship and performance unfold. There is movement in tandem, running through the space in corded circles, reclining and watching boys noodle with guitars, phones to ears, phones held up to the screen, phones held in the air to capture the sound in the room at the moment. And of course the phones were a prop. They didn’t actually work. They were connected only to each other. 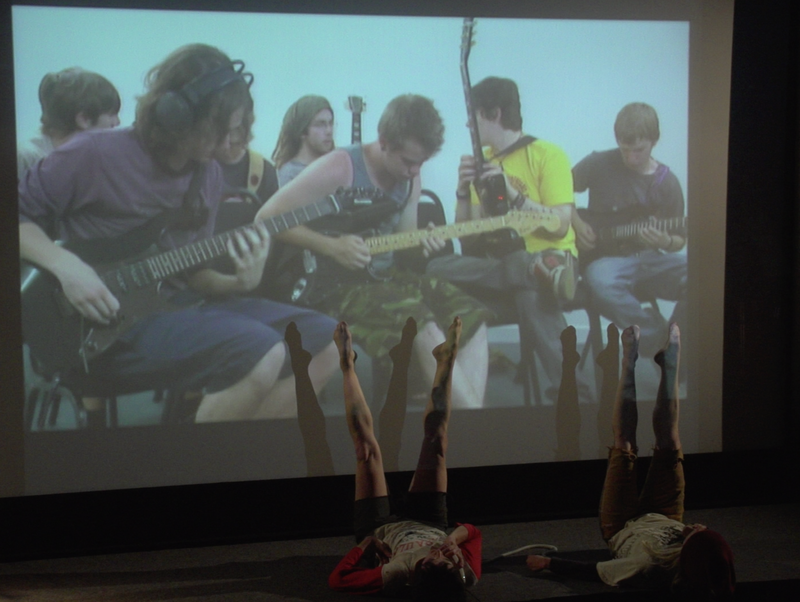 Just as the guitars and drumsticks in the film are not making music, they’re a tool or prop whose purpose is to train the body to move in concert with other bodies. We are trained, we are socialized, we train each other, we motivate one another to make music, make art, practice harder, get really good. We are always both performer and audience, and we are always doing it together, and that is ultimately the point—not the particular song itself in 4:4, but the fact that we can make it and experience it together, that we are connected through the tools and the sound that flows through them. It’s weird to be a filmmaker around performers. To make something that can travel far away on a film reel, a tape, on a hard drive, on the internet, to toil away at something and finish it so that it can be watched far away, forever, again and again. To not even know if somewhere, right now, someone is watching your work and appreciating it, moved by it. Van Loon said that they let the filmmaker (in England) know that the performance was going on at the Walker, that HIJACK had watched Drum Room hundreds of times, and that they were going to perform with it live for a live audience on Thursday. I bet that really meant something to the filmmaker: it’s one thing to have your film screen somewhere, at a festival, at a museum, and yet another to have other artists invest their time and energy in it in such a sustained and focused way, to make something with it, to respond to your art with their art. The room was full each of the three times I saw it, in the new Mediatheque that was the old Lecture Room, that used to be the lonely, quiet, illicit rehearsal space for HIJACK for all those years. I was there to film the performance for HIJACK, but they mostly don’t make video of their performances available online—they film themselves for work samples for grant applications, and that’s about it. Because I could post it and you could watch it, but it wouldn’t feel the same, I think, because we wouldn’t all be together in our well-rehearsed roles as performer and spectator, sending and receiving like the two ends of a Slimline telephone. 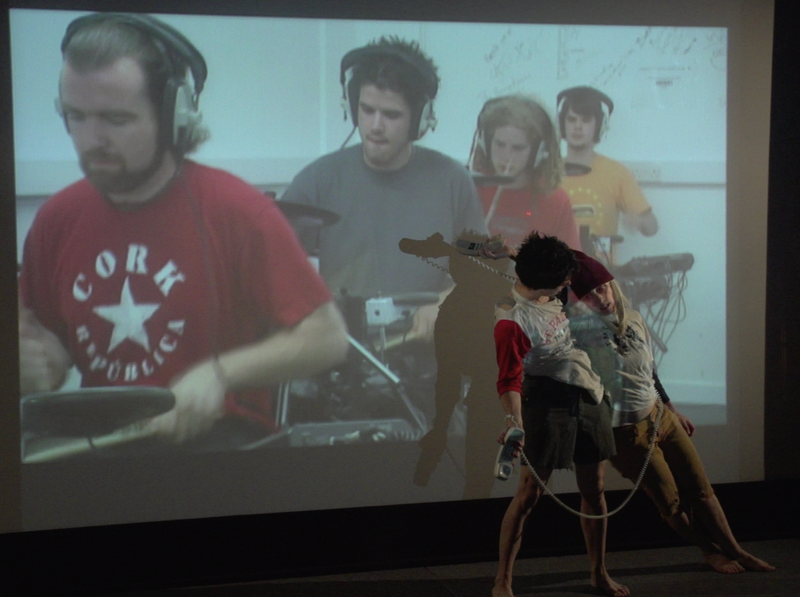 If the artist and the spectator were separated by time and space and the cloud and wifi and Vimeo and our laptop screens, then we wouldn’t have the really special shared experience and memory of that one time, in the Mediatheque, with HIJACK and Drum Room, after all the practice and toil, performing spectatorship and spectating performance together.